The dead fetus found in an airplane bathroom at LaGuardia Airport last month was stillborn, according to officials. The medical examiner added that there was no criminality and no charges will be filed. A cleaning crew made the grisly discovery just before 7 a.m. on Aug. 7. The plane arrived in Queens from Charlotte late the night before. 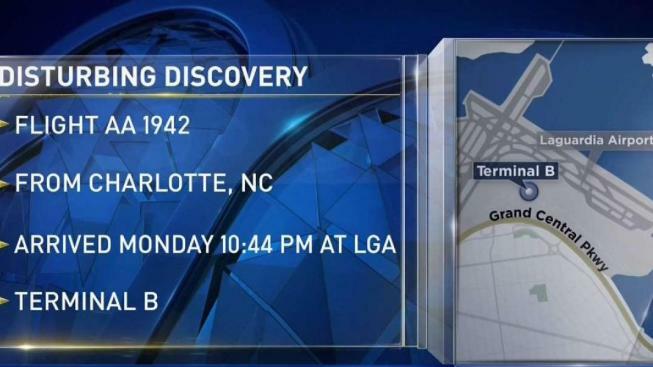 American's flight tracker showed the plane, flight 1942, left Charlotte at 8:56 p.m. and arrived at LaGuardia's Terminal B at 10:44 p.m. Aug. 6. Photos from the scene showed Port Authority officers surrounding the jet on a tarmac Aug. 7 after it apparently was removed from the hangar for further investigation. Detectives tracked down the mother at a hospital in Brooklyn after flight attendants recalled seeing two young women sitting near the back of the plane go into the bathroom after it landed, law enforcement sources familiar with the investigation told News 4 New York. The mother, whose name has not been released, told detectives she had been bleeding for a day or two while they were on a trip in Jamaica. Their flight stopped in Charlotte, North Carolina, before heading back to New York -- and when the plane did land in Queens, the mother said she was uncomfortable. She told cops she miscarried the fetus in the plane bathroom, put it in the toilet and covered it with paper towels. She said the baby didn't make a sound and didn't appear to be alive. The woman said she didn't even know she was pregnant.